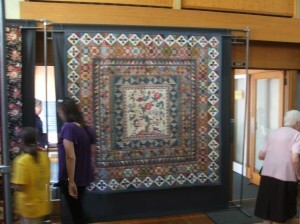 My ‘Tree of life’ quilt was completed in time to hang our in our Easter exhibition. My sister, Maree St.Clair machine quilted it beautifuly as usual. The stars around the edge are taken from the Rajah quilt, so I call them my Rajah Stars. the Rajah quilt was made by Convict women aboard the ship called the Rajah, on its way to Van Diemans Land (Tasmania) in 1841. It was made as a gift for Elizabeth Fry, an English Quaker women, who worked to improve the life of the prisoner in Newgate Prison, London.